This resignation letter notifies a client or contractor that the contract is not being renewed. 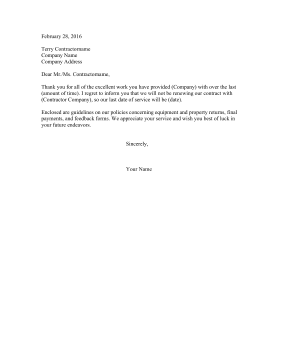 Thank you for all of the excellent work you have provided (Company) with over the last (amount of time). I regret to inform you that we will not be renewing our contract with (Contractor Company), so our last date of service will be (date). Enclosed are guidelines on our policies concerning equipment and property returns, final payments, and feedback forms. We appreciate your service and wish you best of luck in your future endeavors.